Factory Authorized Representative of Leak Testing, Machine Bases, Machine Tool Protection, Drilling & Tapping, Material Handling, Radial Riveting, Fastening & Positioning, & UV Curing Equipment. Blue Ridge Industrial Sales, Inc. is the exclusive manufacturer's representative for the Hennig line of protective machine coverings and chip/coolant management systems. Hennig products set the standard for safeguarding machines and components, improving the life of precision machines and the accuracy of their output. Constructed from rolled high-grade sheet steel, Hennig's custom steel covers protect machine way surfaces, ball screws, servo motors, and other sensitive machine parts under the most extreme conditions. With heavy-duty construction and components, their chip conveying systems withstand the rigors of constant use and require minimal maintenance. Also offered, are specially designed heat-sealed bellows, which are built from the highest quality materials and feature a tailored fit for maximum reliability and durability. Many of the biggest names in the metalworking industry turn to Hennig products year after year to protect valuable machines and the people who operate them. Serving customers in the Georgia, Alabama, Tennessee, and Florida region, you can rely on Blue Ridge Industrial Sales to supply these products in a timely and coordinated manner. Contact us today to learn more. 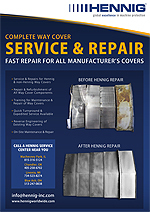 Fast repair for all manufacturer's covers. BLUE RIDGE INDUSTRIAL SALES, INC.